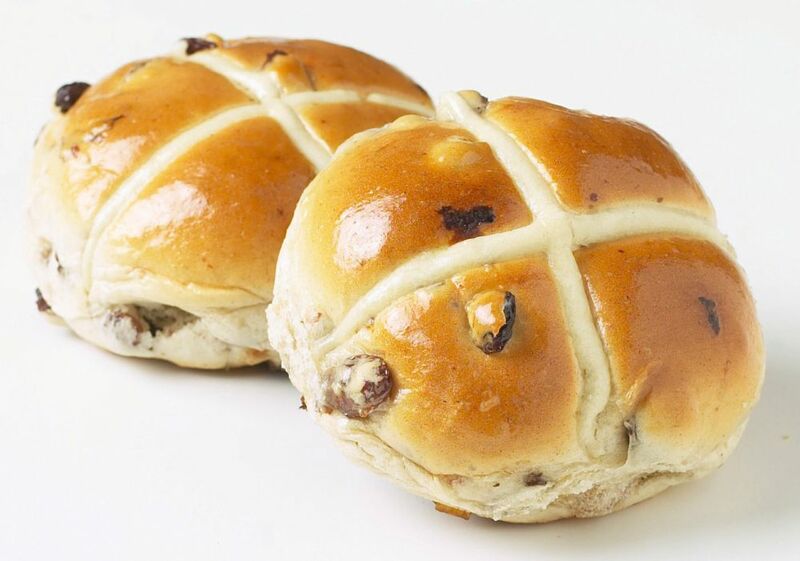 Hot cross bun is a spiced sweet bun made with currants or raisins and marked with a cross on the top, traditionally eaten on Good Friday in the United Kingdom, Ireland, Australia, New Zealand, the Caribbean, South Africa, India, and Canada, and now available all year round in some places. Hot cross buns may go on sale in Australia as early as New Years Day, or after Christmas. In many historically Christian countries, buns are traditionally eaten hot or toasted during Lent, beginning with the evening of Shrove Tuesday (the evening before Ash Wednesday) to midday Good Friday. In Australia and New Zealand, a chocolate version of the bun has become popular; coffee-flavoured buns are also sold in some Australian bakeries. They generally contain the same mixture of spices, but chocolate chips are used instead of currants. There are also fruit-less, sticky date and caramel, and mini versions of the chocolate and traditional bun. In the Czech Republic, mazanec is a similar cake or sweet bread eaten at Easter time. It often has a cross marked on top. Recipe for Hot Cross bun see Here and Here.